Kevin Mileham and Bobby Stevenson address Walmer residents. 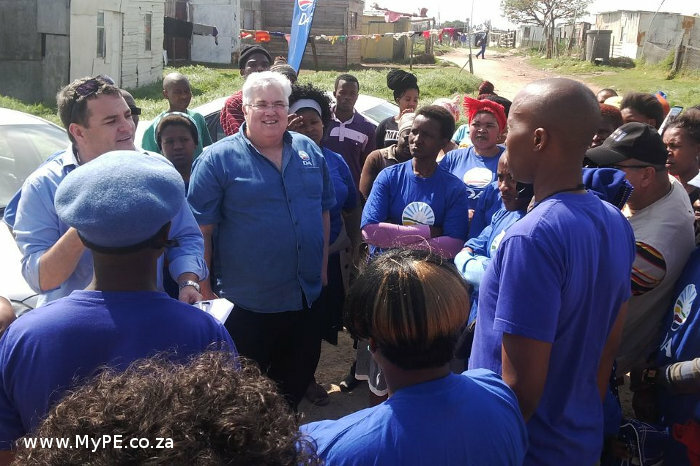 The following speech was delivered in Nelson Mandela Bay’s Walmer Township today, by DA Shadow Minister of Cooperative Governance and Traditional Affairs, Kevin Mileham MP. Today, we hand over our complaint to the South African Human Rights Commission (SAHRC) to investigate the rapid increase of the use of the bucket toilet system, particularly in the Eastern Cape. We will assist the SAHRC to determine why and where these horrific bucket toilet systems exist and how to get rid of them. We will also hand over our photographic evidence to the SAHRC following our own investigation. The bucket toilet system is an assault on human dignity. The way in which we handle human waste says a lot about us as human beings. And according to the Non-Financial Census of Municipalities for the year ended June 2013, conducted by Statistics South Africa and released on 29 August this year, the ANC has a lot to answer for. According to the report, the number of bucket toilets in the Eastern Cape has skyrocketed by 36% in the past year. The report shows how the number of bucket toilets (the eradication of which is a national priority) has increased from 38 606 in 2012 to 52 732 in 2013. Other provinces that have shown increases are the North West, (an increase of 18.2%), and KwaZulu-Natal which went from 0 to 1585 bucket toilets. The official municipal figure for Nelson Mandela Metropolitan Municipality increased by 34.2% in the past year to 30 202 buckets. Our own investigations put the number at approximately 38 000 across the municipality. Right here in Walmer Township, the Nelson Mandela Metropolitan Municipality services 3065 bucket toilets. That is more bucket toilets in one township than there are in the entire Western Cape, according to StatsSA. And I use the term “services” very loosely, as days go by where the municipal collection and disposal of human waste does not occur. This municipality is the largest contributor in the country to the bucket toilet problem, with approximately 10% of all bucket toilets in South Africa found here. Our own investigations over the past 3 months has uncovered a horrendous state of affairs, where raw sewage flows through streets in informal settlements, or sewage treatment facilities are pumping untreated sewage back into the watercourses of South Africa. All of this is unhygienic and a primary cause of waterborne illness. But the bucket system is perhaps worse, in that, in addition to the health aspects affecting both users and sanitation workers who are expected to handle the waste on a daily basis, it is dehumanising. Former Minister of Human Settlements, Tokyo Sexwale, undertook in 2009 to completely eradicate the bucket system by the end of his term in office. Connie September, while Minister of Human Settlements, also accepted that this form of sanitation undermined the dignity of our communities and vowed to ensure its total eradication. Both failed spectacularly in this endeavour. One is left wondering just how it is that we have managed to go backwards in such a short timeframe? The answer lies in the priority that this has been given at local level. In Mayor Zamuxolo Wayile’s tenure, R500 000 was budgeted for the total eradication of bucket toilets. Nothing was spent. The budget was carried over into the next year. In the last financial year, under Mayor Benson Fihla, R9 million was budgeted. Again nothing was spent. This financial year, the figure has increased to R30 million with a further R30 million allocated to each of the next two financial years. And to our knowledge, nothing has been spent. The DA has repeatedly asked in council why this is not being addressed. We have submitted a prior complaint to the Human Rights Commission about it. And it is only our continued questioning of this issue that keeps it on the agenda, as it appears that the municipality and the ANC lack the political will to address the problem. In fact, the in-fighting in the “ruling party” and the maladministration in local governments across this province are significant contributors to the massive increase in the number of bucket toilets. While it can be legitimately argued that rural-urban migration is placing an unprecedented demand on municipalities to provide basic services, the tragic truth is that not enough is being done to address the problem. The sanitation department in Nelson Mandela Metropolitan Municipality is chronically understaffed. Its sanitation infrastructure is rapidly ageing, and hundreds of millions of rands will be needed to upgrade the system to cope with increased demand. And this is true of municipalities across the country. It is this failure, by the ANC led municipal council and its administration, that has resulted in that party falling to below 50% in the 2014 election in Nelson Mandela Metropolitan Municipality. It is dissatisfaction with the status quo that results in service delivery protests and ultimately regime change at the ballot box. The DA will today request an investigation by the SAHRC to identify the root causes of this problem, and provide recommendations to municipalities on a way forward. In this way, we want to draw attention to the fact that what these municipalities are doing, by not spending adequately, by not staffing up, by not providing basic services, is in fact an infringement on the rights of our people, and must be rectified as a matter of extreme urgency. This is not a “good story to tell”. In fact, it’s a shocking indictment of the status of South Africa’s approach to local government in general and sanitation in particular. The eradication of the bucket toilet system and proper, high-quality water and sanitation provision must become a major priority for service delivery in the province and the country.